Last November, the world celebrated the 80th birthday of Walt Disney’s eternal character, Mickey Mouse. For eight decades, Mickey has managed to enchant millions around the world with his landmark voice (recorded eary on by Disney himself), oversized shoes, big ears, and blue overalls. At 80, he still can dazzle visitors—and have his picture taken with them—at EuroDisney, Disneyland, and Disneyworld. Unlike us, Mickey does not grow old with age. He doesn’t take sides in times of war. The economic crisis of 1929 did not break him—nor did the world financial crisis of 2008. Nothing stuck to Mickey Mouse; neither World War II, Vietnam, 9-11, Afghanistan, or Iraq. He probably never heard of George W. Bush, or Osama Bin Laden, or Saddam Hussein. He is the only person who was not surprised at the election of Barack Obama—anything can happen after all, in Disneyland. This observation, however, does not only apply to Mickey and other Disney characters. It applies to all fictional characters who have transcended time, ripped down political, psychological, and social barriers, and captured the hearts of children and adults, in every city around the world, from Los Angeles to Tokyo. We’re talking Sherlock Holmes, James Bond, Charlie Chaplin’s Little Tramp, Bugs Bunny, Pink Panther, Tintin, Popeye, Superman and Batman. Today, Tintin and Popeye stand both at 79. Superman is 76. Bugs Bunny is 68. Asterix is only 47. The Pink Panther, even younger, is only 44. 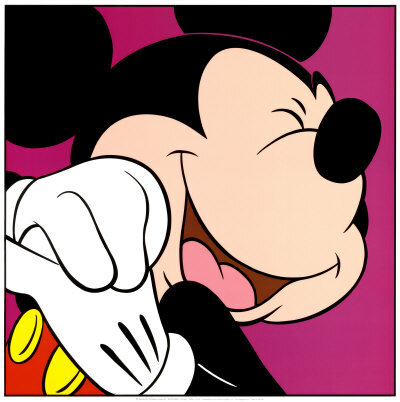 Mickey is the oldest among all the world’s most lovable characters. He first entered Syria in the mid-1930s, through a French investor working with a Damascene businessman from Bab Touma. The black & white cartoon film, Steamboat Willie, was shown at one cinema and billed as bringing “the mouse from America—one of the wonders of the 20th century, to Damascus.” The Damascenes—needless to say—adored Mickey Mouse. Although the film had sound, and the Damascenes spoke French, rather than English, they roared with laughter at the Disney creation; putting up little effort to understand the plot. We don’t have such characters in the Arab world, certainly no Mickey Mouse. When King Abdul-Aziz of Saudi Arabia was first shown a cinematic production on board a ship headed to the Suez Canal in 1945, he gasped at black & white images of Popeye the Sailorman. The aged king of Arabia giggled as Popeye puffed away on his pipe, roared his famous chuckle, and drank down spinache in battle to capture the heart of his Olive Oil. He remarked that “this Popeye is so fun—so amusing—that it is impossible for me to allow him into the Kingdom! He certainly will distract worshipers and prevent them from praying!” During the Black September events in Jordan in 1970—and again during the seige of Beirut in 1982, Yasser Arafat used to indulge himself with the mischief of Tom & Jerry cartoons. It was his only pastime and stayed with him until his long seige in Ramallah, until 2004. He never missed a single episode, and saw many of them over and over again—probably getting some inspiration for his never-ending war with Ariel Sharon. Abu Ammar always thought that these cartoons were too violent for children, however, shrugging at the thought of a young child imitating what he sees on screen and slamming the piano on somebody’s fingers, placing dynamite underneath his pillow, or slicing him in half with a kitchen knife! He nevertheless adored the scene when Tom was a music conductor, and Jerry insisted on taking a nap during a concert—within the piano. Arafat watched it over and over again. In Syria, the closest thing we ever had to a lovable character is that of Ghawwar, a street prankster popularized in the 1960s by Syrian legend Duraid Lahham. Although absent from the screen for over 20-years, Ghawwar—who turns 45 in 2008—remains an all-time favorite not only for Syrians but for Arabs in general. Ghawwar was watched by everbody—beys and pashas of the 1950s, socialists and generals of the 1960s, Islamists, seculars, and communists. In the early 1960s, during they heyday of radical socialism, the Syrian government met to issue important laws on nationalization of banks, land, and industry. The meeting was adjourned, because of a lack of quoron. Why didn’t the ministers show up, the Prime Minister asked? Because a new Ghawwar series—called Hamam al-Hana—was being broadcasted live on Syrian TV. The socialists preferred getting a good laugh out of his pranks, than sitting behind their office desk, nationalizing property. A senior official approached the Hamam al-Hana team and said, “Either you change the time of your broadcast, or we have to change the weekly meeting of the Cabinet of Ministers.” Since shows were broadcasted life, chanting them was very difficult. The Syrian government nodded, and changed its weekly meeting, to accommodate Ghawwar!